Day 8 – Toffee Popcorn! 2 disposable foil roasting trays. 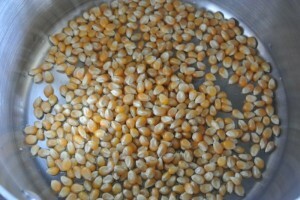 Start off by popping the corn – add the oil, followed by the kernels. Lid on the pan and then heat over a medium heat until the popcorn starts to pop. Move off the heat as soon as the popping stops otherwise the popcorn in the bottom will start to burn. Preheat the oven to 120c (fan)/140c/Gas Mark 1. Divide the popped corn between two disposable foil roasting trays. Into another pan put the sugar, butter, syrup and water. 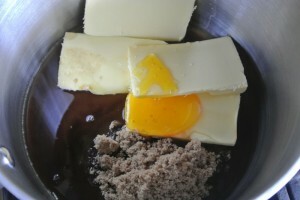 Heat it gently until the butter melts, stirring it fairly often. Brush down the sides of the pan with a pastry brush dipped in water to get rid of any sugar crystals. 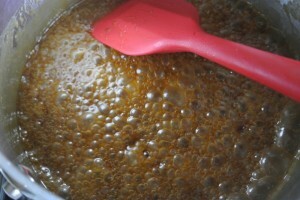 Bring the mixture to a bubble and let it simmer away for 5 minutes and take it off the heat. 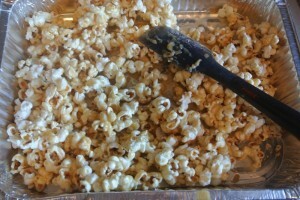 Pour half of the toffee mixture over each tray of popcorn. Toss the popcorn to start to coat it in toffee. It’s not easy – you’ll have popcorn flying all over! Once all mixed up bob the trays into the oven for 15 minutes. Take them out of the oven and toss them up again, then back into the oven. You want to bake for 15 minutes and then toss again a total of four times. The last time they come out of the oven keep turning the popcorn with a spatula, breaking up the pieces until it has cooled enough for the toffee to be set. Making sure to break up the pieces as you toss and turn. You can serve it right away – my rule is any pieces that jump out of the tray onto the worktop are mine to eat whilst I work, or you can put it in an airtight container where it will be fine for upto a week. 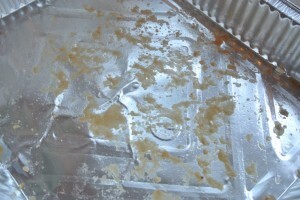 And the reason for the disposable roasting trays? Oh and the cute red and white paper cups are by Paper Eskimo on Amazon here – certainly not compulsory but definitely festive! This entry was posted in Caramel, Children, Egg-free, Treats. Bookmark the permalink. 443 Responses to Day 8 – Toffee Popcorn! Oh this is perfect, thank you! 🙂 one of our traditions is that on Christmas Eve we each open a present of new Christmas PJs and watch a DVD together…with popcorn of course, which is my daughter’s favourite part – she’ll love this! Why the baking? what happens if you just mix the toffee over? Thanks – I was wondering that as well. Thx Ruth, baking your Danish Pastry today although its getting hot here in Aus. 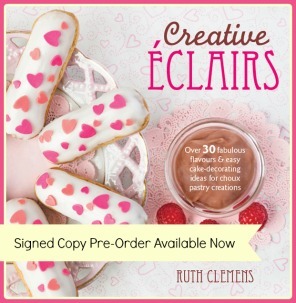 Another lovely idea Ruth! These cute little paper cups would stop us from eating too much too..unless I just kept refilling them of course!! My kids love pop corn and this is so easy, will definitely be trying this for a lovely Christmas snack! Miles cheaper and tastier than stale cinema popcorn.I might try this with some chocolate added to the recipe! Saturday night is popcorn night in our house. Dare I treat them to this version tonight? Do you think it would work with a dairy free alternative to butter? Have a small child friend who can’t have dairy and sweet treats are hard to come by! Thanks, will maybe give it a go then! Lovely! The kids will love this! Thank you. I love those striped cups! Dam I have just come back from shopping…. Oh well tesco here I come again!!! Favorite treat..very easy and yammy..
Lovely idea for when you’re fed up of Christmas type food. Wow the first to comment!!! My little boy has now started checking to see what the next day brings (this is his favourite so far), we have friends coming round this evening with 2 children, I think this could be on the menu!!!!! Could do with some of this to eat whilst watching Elf… 🙂 And the paper cups are so cute! At last – something in popcorn that is not salty!! Toffee popcorn is my fave! 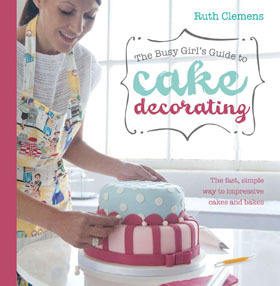 I’m so making this tonight….when the kids have gone to bed! This will be a good one for Boxing Day whilst watching a Christmas movie and just chilling!! ooh yum!! going to take thesed to work for a christmas jacobs join!! My family loves popcorn we tried it once and forgot to put the lid on!! We still laugh about it !! Mmmm toffee popcorn, I just love it! Top tip using disposable trays. Mmmm can’t beat toffee popcorn! I’d not considered making my own popcorn before, but have used it in chocolatey gifts. This certainly goes the whole hog, and with clear steps throughout as always. Thanks. we are getting spoilt now!!! Yet another tasty treat I would happily tuck into! Yummy! My husband like salted popcorn. But I think that toffee popcorn is the only way to go. Thanks Ruth. Oooooh no!! It’s bad enough that I can buy toffee popcorn let alone make it myself! My poor poor teeth 🙁 Haha, thanks darl, will definitely have to have a try! That’s a very clever idea about the disposable roasting tin. It’s the sort of thing I always think of AFTER I’ve made an unholy mess in the kitchen. Thanks for that! that looks great and very yummie!!! I cannot believe this is today’s post! I was at a posh garden centre yesterday, they had a 6 inch pavlova case for sale for £11.99!!! And toffee ‘air popped’ corn for £6 a bag. I could supply my whole road with popcorn for £6 now! Looks Fab- will love this with a good movie on a Saturday night!!! What a danger, I have all the ingredients at home!! supper yummy, I’m off to try this with the kids right now! Very easy way to keep the kids quiet! Lovely…..pull up a seat and lets watch a film and eat popcorn. 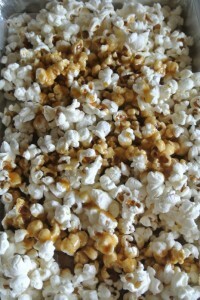 I love toffee popcorn but never knew how to make it at home so I’m going to try this recipe. I think this may be made tonight to eat whilst sitting in front of the fire and watching a film. Mmm, much beter than cinema popcorn! This looks great I can’t wait to make this for a movie night. love the idea that any that pop out of the pan belong to the cook. sounds good to me! Can’t believe I’ve got all the ingredients – guess what I’ll be scoffing whilst watching Strictly tonight?! I like the look of these! we are watching white christmas this afternoon. christmas movie and popcorn, fan dabby dozey ! I never thought of popcorn as Christmasy but I might try doing that this year. This looks like a fun and scrumptious recipe. I’ll definitely be trying it! It’s like you read my mind! I bought some popping corn the other day and I was wondering what flavours to do! Oh yum! I love toffee popcorn! I have a very sweet tooth, and popcorn is one of my favourite snacks. Thanks for this, perfect for all the Christmas films coming up! I am not sure how much more I can cope with! Nom nom! Love the little striped pots as well! We are giving this a go tonight. Popcorn & Elf DVD! Can I ask where you got the red & white cups that the popcorn is in – i love these! Wow, yummy! Gonna try this soon! mmm this would be great with my all time favourite christmas movie – Elf! My girls will love this. Mmm… A big bowl of this and watching Elf – what could be better? This looks so yummy. Does anyone know where you can get GMO free or organic popping corn though. Have had to hide this from my children! Perfect! I’ve been looking for a recipe for this for a long while now. Will definitely give this one a go. My oh my – this is def something we will be making. Well now I know what we’ll be having when we’re watching Elf tomorrow! So good that it can be made in advance – very handy at this busy time of year. Popcorn is always a good idea! Can’t wait to try this one-a perfect holiday treat! Totally agree with the disposable trays! and the popcorn would make it more enjoyable. Am I the first to leave a comment today? Wow! this looks great – my family will love it watching movies and eating popcorn, too! love it. My son is into popcorn I think I could make the toffee popcorn for him. We absolutely love popcorn in our house so this will make a fantastic new taste, just need a good movie to go with it!!! Wow! What a prize to cook up a storm in the kitchen with! It’s so easy when you know how, isn’t it? – and far cheaper, fresher, and much more fun than bought. A great snack to munch on while snuggling up on the sofa and watching all those Yuletide films…..Merry Christmas! Yum! Perfect for munching during all those traditional Christmas films! That sounds absolutely delicious! Most of it would have to end up on the worktop in my house!! That looks so delicious – I think I hear it call my name!!! This looks really easy and very tasty! This looks great! I might have to try some for my little boy’s birthday party next week! A movie’s not complete without delicious popcorn! Will certainly be making this very soon! Wait… am I first? Hooray! Great tip re sticking them back in the oven, last time I tried this I ended up with only half coated before the toffee hardened! I have been looking for a recipe for toffee popcorn for ages! This one looks perfect! Yum! Perfect for an Xmas film. Looking forward to making this ! Looks yummy! I love toffee popcorn. Unfortunately whenever my son makes popcorn he salts it. Salted popcorn is so wrong! Yum! Just the thing for a festive home movie night. 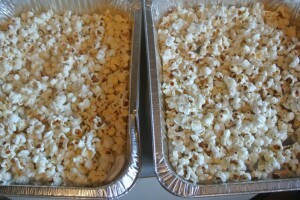 I make popcorn all the time for hosting small groups of people – but never knew how to make it this nice! Great for movie nights in!!! No brainer in our house. We LOVE popcorn here! Never made it before, but I’ll give it a try. The grandchildren will love it. ooooh the children will love this. But will they get a chance?…. my hubby is a popcorn fanatic!! This popcorn looks yummy, I can’t wait to try it. Thank you for all your great recipes! these look great but I think I am probably too lazy to do the fourtimes-baking part. It’ll be a bag of butterkist at my house if anything! Thanks for this recipe Ruth! Looking forward to trying it out – yummy! A shipping container will definitely be required for all these fab goodies. And the toffee popcorn is tempting too. I’m with you on the disposable baking trays. Great idea and a fab recipe, thanks! Must admit i’ve never made popcorn at home and I didn;t realise it would be so easy – may have a go myself now! What a lovely set,handy for on the christmas table!! 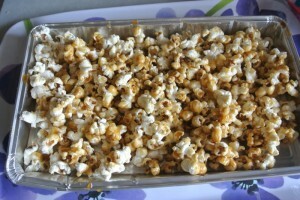 I’ve tried making toffee popcorn before resulting in a soggy mess, great idea to bake it. I know what I am doing tonight! I love this blog! About time we saw you on TV again isn’t it? Oooh perfect for our Christmas Eve tradition of watching Polar Express in our jammies! Think I am going be a dress size bigger after Christmas!! This popcorn is def going in my ‘to try’ list!! Always wondered how to do this. Thank you!!! A Blockbuster of a treat. That’s my Andy sorted for snacks! Perfect for eating in front of a Christmas film I think! I am making this for my daughter tomorrow! 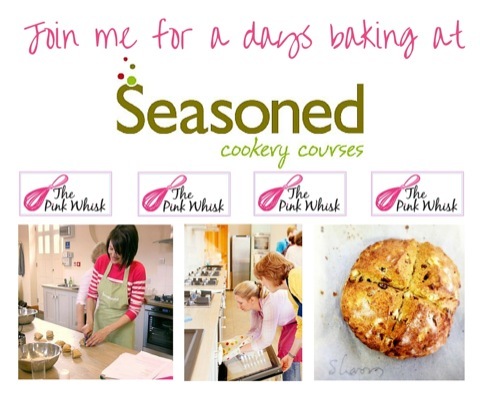 So little time and so many gorgeous lovely recipies – where do I start? 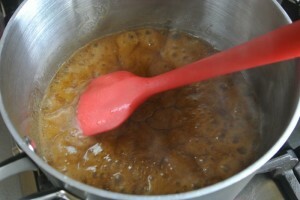 I’ve often wondered how to make toffee popcorn, now I know and next time I feel like popcorn, I’ll give it a try. Thank you. I love toffee popcorn. Never thought of doing it myself. But a fab treat, to sit down with a tub of that and watch those good old films after the washing up is done. Those red and white cups are fab! wow my children love popcorn!! I will for sure having a go at this reipe!! This looks great, I will have to try it, as I think my kids would love it and hopefully it would not be too difficult. oh and I would love the hamper ( shipping container!) 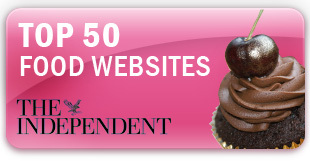 of goodies, that would get me trying a lot more adventurous things with my baking! Fantastic recipe – I’ve always wanted to make proper toffee popcorn at home, will definitely be giving it a go! Yum…haven’t had this since I was a kid! Will now be introducing my own kids to it, I think!! Sounds delicious, we love popcorn in our house with just a little salt and butter. I love popcorn, so will definately be giving this a go. 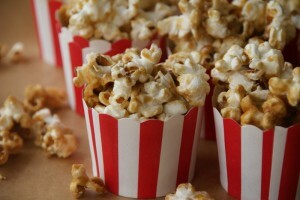 You wouldnt believe how much I love popcorn, these recipes are just toooo good, and still 4 more to go?!?! My 5 year old would go mad for this – she loves popcorn! Perfect accompanient whilst wrapping christmas pressies tomorrow afternoon! This looks lovely and I love the little pop corn boxes – too cute! That popcorn looks deeeelish, will deffo give it a go, if only we had the roaring fire to go with it! My wee sister loves toffee popcorn. Thanks for the recipe. phew…just made it today with a few minutes to spare! this popcorn looks scrumdidly umptious.. will definitely be trying this. thanks again for super recipe. 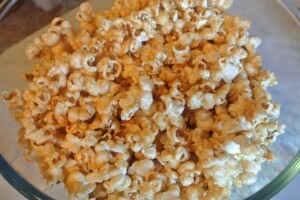 Love homemade popcorn but I’ve been struggling to find popping kernels anywhere lately. Only microwaveable stuff, hate it! Will continue searching until I get MY POPCORN! Love those popcorn containers will definately be ordering some. Perfect for Xmas movies , and for stringing on the tree! My mum would love this! I shall definitely need to ive this a go, after christmas now though I think. Great recipe…and I just love the serving cups! I’d actually never considered making this before, but you make it seem so easy! One for my children, they love popcorn and the bakeware would be much appreciated. my kids will love this with a Christmas film – perfect for xmas eve! We have planned to have a movie and popcorn before bed time Christmas eve this would be lovely will be giving this a try thank you for a fab idea. Now you are talking!! Christmas eve snacks sorted! Made this lovely toffeelicios treat this afternoon for our early evening movie.. Everyone loved the popcorn and I know it will become a firm favourite. I like the cartons you show in the picture, although judging on how my lot reacted, they may be too small and they will be asking for refills every few mins! How can I sneak this into the cinema without eating it on the way ???!!! will definately be trying this one out. 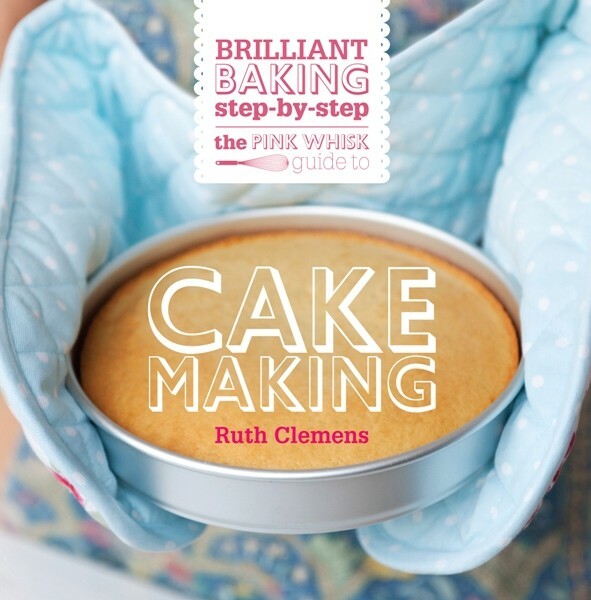 My Christmas presents are going to be totally Pink Whisked this year! Thanks for the disposable tray tip. I hate cleaning really stuck on stuff. Defo making this Xmas eve. One of the few great American inventions!! Who would want shop bought pre-packed popcorn once you’ve made it like this? … so yummy! Looks great! Perfect snack to have with a Christmasy film. Amazing – we made this yesterday and took it to the cinema – kids loved it !!! Perfect for a Christmas film! Woo Hoo….. bring on movie night!!! Time to dust off popcorn maker for the home cinema. Love love love toffee popcorn! Would just love any one of the gifts in this hamper for my lovely sister in law in UK. My Grand kids would enjoy this! Love this and the little containers too! I know one little boy (and one big mummy!) that will love chomping on this! Will be giving this recipe a go! Thanks! Big bowl of popcorn, Christmas film on telly, Happy Days! YUM! This one is definitely a keeper! Shall get it written into the recipe book. hopefully posting in the right place now as had posted via Facebook every day so glad I saw your Facebook message in time Ruth. how would you make sweet or butter popcorn. Prefer them to toffee. We just made it and it was yummy! 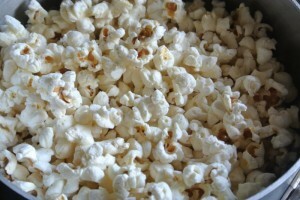 I saw popping corn in the supermarket last week, but thought I’d better find a recipe first. Now I’ve got no excuse! Looks yum but unfortunately due to the tooth I’ll not be having this in a hurry! Another great festive recipe – loving the reduced washing up with this one! Does popping corn go off? I have a packet of the stuff from two Christmases ago when I realised that popcorn garlands would just encourage the dogs to eat the tree. Will have to make this for when we watch . Going to have to make this for the peachicks as they are popcorn mad – and always looking for new ways of making it for them as can’t buy it due to their allergies! I’ve made popcorn before, but never baked it! If it solves the stickiness problem, I’ll have to give it a try…. Yes Popcorn! I will eat you!! Nom nom! Ooooh I love the festive containers! I’ve made it this afternoon. It tasted and smelled delicious! 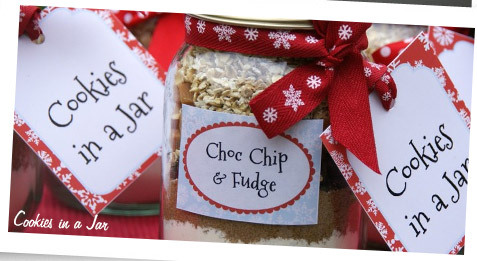 My husband would love this, going to make some for our Boxing Day movie night! Wow, perfect for all of the Christmas films. Planning on hiring ‘Arthur Little’ my 5 year-old would love this to watch it with! I neeed to make this – plan for tomorrow night! Loving it movie and now the popcorn to go ! Is this your version of “Butterkist”? I’ve been in Canada for 45 years and have yet to find a sweet popcorn to match that taste. Poppycock is the closest that I have found.